Listen to interviews of your favorite authors like Dean Koontz, Anne Rice, Christopher Paolini, Terry Pratchett, R. L. Stine and many more. Kate DiCamillo is the bestselling author of Because of Winn-Dixie, which received the Josette Frank Award and a Newbery Honor and was made into a movie by 20th Century Fox; The Tiger Rising, which was a National Book Award finalist; The Tale of Despereaux, which won the Newbery Medal and was made into a movie by Universal Pictures; The Miraculous Journey of Edward Tulane, which won the Boston Globe Horn Book Award and was optioned by New Line Cinema; and more recently The Magician's Elephant. Note: The following interview has been transcribed from The Author Hour radio show. Please excuse any typos, spelling and gramatical errors. Matthew Peterson: Hello and welcome to the Author Hour: Your Guide to Fantastic Fiction, which can be found at www.TheAuthorHour.com. I’m your host, Matthew Peterson, best-selling and award-winning author of Paraworld Zero. Last week I had James A. Owen, Frank Beddor, John Flanagan, and James Dashner. This week I’ve got several more children’s authors: Kate DiCamillo, Bruce Coville, Peter Morwood, Diane Duane, and Tony Abbott. My first guest is Kate DiCamillo, bestselling author of Because of Winn-Dixie, which received the Josette Frank Award and the Newbery Honor and was made into a movie by 20th Century Fox; The Tiger Rising, which was a National Book Award finalist; The Tale of Despereaux, which won the Newbery Medal and was made into a movie by Universal Pictures; The Miraculous Journey of Edward Tulane, which won the Boston Globe Horn Book Award and was optioned by New Line Cinema; and her latest novel The Magician's Elephant, which I just finished reading last night. Thanks for being on the show today, Kate. Kate DiCamillo: Thank you for having me. Matthew Peterson: So right out of the gate, your first novel, Because of Winn-Dixie, got the Newbery Honor and plastered your name in front of all the librarians in the country. Kate DiCamillo: Bless the librarians. I love them. Matthew Peterson: Oh, yes. As a first-time author was this even a thought in your mind that this could happen? Kate DiCamillo: Oh, no, not at all because I worked for a book distributor at a book warehouse, and I was on the children’s book floor. So, I had a real realistic expectation of what would happen with a middle grade novel and my big pie in the sky dream was that we would somehow manage to sell 5,000 copies of the book and then I would earn out my advance and then it would save me from being remaindered. That was my big dream. Kate DiCamillo: So I would have never dared to have dreamt this big. Matthew Peterson: Well, your second novel, The Tiger Rising, I mean, that brought even more attention to your name. It became a finalist for the National Book Awards. But it was really your third book that really hit the jackpot. The Tale of Despereaux won the coveted Newbery Medal. Kate DiCamillo: Yeah, the Newbery. Matthew Peterson: What did you do when you discovered you had won the Newbery? Matthew Peterson: And she walked onto the wrong airplane. Matthew Peterson: She was so just dumbfounded she walked onto the wrong airplane. So I thought that was classic. Kate DiCamillo: And that seems so huge to me all the time. Kate DiCamillo: Yeah, I had so much fun doing that. You know, Winn Dixie and Tiger Rising were both kind of straight forward novels set in the South. And so Despereaux was a big and scary departure for me. So I leapt hoping that the net would appear. And I thought, “As long as I’m gonna play. I might as well really play.” And so that long title was part of me, you know, having a good time with it. Matthew Peterson: Yeah. What gave you the idea for The Tale of Despereaux? Kate DiCamillo: It was actually my best friend’s son, who was eight years old at the time and Winn Dixie had just come out and he’s a reader. And so he was kind of impressed with me. And he said that he had an idea for a book about an unlikely hero with exceptionally large ears and I said, “What happens to the hero?” And he said, “I don’t know, that’s why I want you to write the book.” So that’s kind of where I started. Matthew Peterson: So going to a mouse then. For those that haven’t read the book, tell us just a little bit about the book. Kate DiCamillo: Despereaux is an abnormally small mouse who’s born with his eyes open and nobody thinks that he’s going to live, but he does live and he’s surpassingly strange. He likes music and he likes books and so he’s different from the other mice. And because he’s different, he has an extraordinary fate waiting for him which involves a human princess and a dungeon and a lot of exciting things. Matthew Peterson: Yeah. That reminds me of me. My mom tells me that when I was born my eyes were open and I just looked around and I didn’t cry, and I’m the runt of the family. Kate DiCamillo: You’re a human Despereaux. Kate DiCamillo: So you’ve got big ears and you’re the runt of the litter? Kate DiCamillo: Wow . . . .
Matthew Peterson: And I was born with my eyes open. Matthew Peterson: [laughs] That’s crazy. Kate DiCamillo: Yeah. No. That’s great. I love it. I’ve never met the human Despereaux before. Matthew Peterson: Yep. That’s funny. You know my niece is always telling me that the book is very different than the movie. I saw the movie just the other day with my kids and I really did enjoy it. What were your impressions of the movie adaptation? That’s usually one of the biggest, you know, exciting things for an author to have their book turn into a movie. What were your impressions of the movie? Kate DiCamillo: I thought it was absolutely stunningly beautiful. And it is different from the book and it’s necessarily different from the book. I learned that with Winn Dixie, you can’t be absolutely faithful; they’re two different art forms. And you also learn it’s kind of like having kids a little bit. You send your story out into the world and you hope that it fares well. But I thought it was a beautiful movie and I thought I enjoyed it just as a movie. I was able to separate myself from it and separate it from the book and just enjoy it as a marvelous piece of movie making. But I don’t know, maybe like six months ago I was walking in the neighborhood and a little boy in one of the neighborhood houses came out and wanted me to sign his book and it was this beat up copy of Despereaux. And he said, “We just finished watching the movie too.” And I said, “Did you like the movie?” And he said, “Oh I loved it.” And I said, “Some people think that it’s too different from the book.” And he said, “No it’s like Jazz; the melody’s still there. And it’s just a variation on a theme.” And I said, “I’m going to take your line and use it.” “That’s fine.” ‘Cause to me that’s what it’s like. It feels of the same thematic concerns, and it just looks at them from a different light. Matthew Peterson: Yeah, I think so. And your latest novel is called the Magician’s Elephant. And like I said earlier, I just finished reading it last night. And I did find it just absolutely wonderful; it was really good. Kate DiCamillo: Oh, thank you. Matthew Peterson: It seemed very similar to The Tale of Despereaux in that, not the actual story line, but in that you had lots of numerous threads going on and you get into the minds of a lot of characters, even down to the lowly dog barking. It really paints a picture in your mind. Kate DiCamillo: Oh, that’s a lovely thing to say. Thank you. Kate DiCamillo: Yeah. Yeah, no, that’s it. Through the roof! Matthew Peterson: Through the roof. Yeah. Kate DiCamillo: Yeah. What does that mean? Kate DiCamillo: What’s the symbolic meaning of that? Don’t ask me, I don’t know? Matthew Peterson: [laughs] Well, tell us a little bit about The Magician’s Elephant. What’s the main premise here? Kate DiCamillo: Golly! This is one of those things where I’m not as adept at summing up or talking about it because I’m still kind of in the middle of going out and doing signings and talking with people about the book, and what I do is I listen to other people talk about it and then I use their phraseology because I never know what I’m doing, and so I wait for other people to sum it up. So from what I know so far, it’s a book about finding your way home and a book about love and hope, and the main character, or one of the main characters, ‘cause like you said, there are a lot of people in this book, is Peter, who has lost his sister. They’re both orphans and he sets out to find her. And in the process a lot of people find each other. Matthew Peterson: Was there an event or something that gave you the idea for this book? Kate DiCamillo: I literally, and this is one of those things where it’s inexplicable and it also makes you sound kind of strange. I was in New York at a hotel lobby and I had this vision of like a washed up seedy desperate magician. He kind of like appeared before me. I had my notebook with me, ‘cause I always have my notebook with me, and I thought I should just write down the description of that. This magician who has seen better days and is struck with this sudden desire to do real magic. And so that’s where it started, with the magician. And then after a while the elephant showed up. And Peter. Matthew Peterson: Well, I enjoyed the illustrations as well. I mean there’s illustrations throughout the books and they really paint that picture of the scene really well. Do your other novels have illustrations? Kate DiCamillo: Yes, I have been enormously blessed with illustrators. Bagram Ibatoulline, who did Miraculous Journey of Edward Tulane and also Great Joy, which is a picture book that I did. He has this wonderful ability to kind of paint what’s in my head. And you don’t talk to the illustrator at all and they’re working and the writer and the illustrator are kept separate. So it’s a kind of an astonishing thing to have him do that. Yoko Tanaka who did illustrations for this book has deepened the whole story and made it more magical, more atmospheric, I think, with the illustrations, which are incredible. Matthew Peterson: Yeah, they’re very detailed. Well, the ending was really great, it wrapped up all the threads together just nicely and makes you really think about, you know, makes you reflect what you’ve just read. Well, you also have a series of books for younger readers called the Mercy Watson series, and I noticed that the last one was called Something Wonky This Way Comes. And when I saw that name, just a flood of memories came into my mind of that old Disney movie, Something Wicked This Way Comes. Did that have any play in the name of your book. Matthew Peterson: It didn’t! Okay. Kate DiCamillo: Again, just me amusing myself, which is what Mercy has been about. It’s just a wonderful place for me to rest on the page because you know, people always ask you what your books mean and when you write for kids, what lesson did you mean to impart. And these books are the answer to that. There’s no lesson in them anywhere. It’s just fun and romp. Matthew Peterson: What are you working on right now, though? Kate DiCamillo: I’ve got what... Stephen King’s written a wonderful book on writing, have you read it? It’s called On Writing. Matthew Peterson: I’ve heard of it. I haven’t read that one yet. Kate DiCamillo: It’s really good, if you get a chance to pick it up, you should. He talks in there about how he’s always got a big project going on and then he’ll have what he calls a toy truck. You know, something that he kind of pushes around and plays with and he doesn’t know if it’s going to turn into something or not. And that’s what I’ve got right now, a couple of toy trucks. We’ll see if they turn into anything. Matthew Peterson: How fun. Well, that’s great. 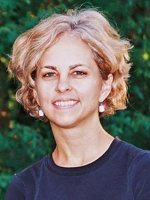 I’ve been speaking with Kate DiCamillo, Newbery award-winning author of The Tale of Despereaux and The Magician’s Elephant. Thank you so much for being on the show today, Kate. Kate DiCamillo: Thank you. It was great fun. Matthew Peterson: Okay, make sure you visit www.TheAuthorHour.com to listen to the bonus questions. Don’t go away, I’ve still got Bruce Coville, Peter Morwood, Diane Duane, and Tony Abbott. Read or Listen to the extra questions that didn't make it onto the live show. Share this interview with your friends!